Divemaster Zoe Greenberg took these rare photos off Lana`i in August 2011 at a depth of about 60 ft. Zoe's "animal" was about 2 ft. long. In fact, this is not a single animal but a colony of hundreds of tiny tunicate animals that together form a tube, closed at one end and open at the other. 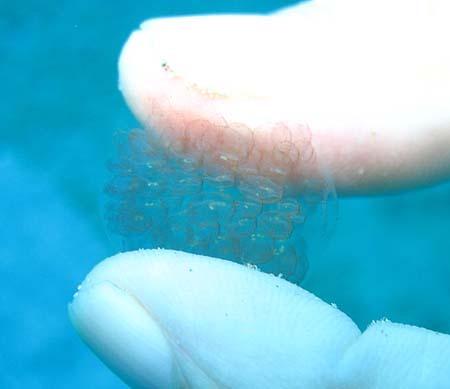 The tube is covered with short, slender, pointed projections (papillae) and, if you look closely, a tiny reddish organ is visible inside the translucent body of each of the little tunicates. In Hawai`i, these pyrosomas are typically about 4-5 inches long; to see one at all is unusual, and to find one of this size is practically unheard of. These strange drifting creatures look gelatinous but are actually rigid and surprisingly hard to the touch. Pyrosomas propel themselves by expelling water from their open end. Each animal takes water in along the outer part of the tube, filters it for microscopic food particles, and empties it into the inside of the tube, where it exits at the open end. The genus name Pyrosoma means "fire body" and these animals are brightly luminescent if disturbed. Probably the luminescence is visible only in the dark. An internet search turned up something that looks very much like it called Pyrosoma atlanticum, which is supposed to be the most common Pyrosoma in temperate and tropical waters worldwide. Sure enough, a visit to the Bishop Museum site shows that 2 subspecies of P. atlanticum have been recorded from Hawaii: Pyrosoma atlanticum hawaiiensis and Pyrosoma atlanticum paradoxum. It would probably take an expert to determine which is which. Susan Scott wrote a fun column on these animals. For more detailed information, check out the neat Jellieszone website. Here's a smaller pyrosoma. A number of these were floating around at about 65 ft. over a featureless flat sand bottom off Tracks Beach Park, O`ahu. (near Kahe Point) on Oct. 10, 2006. They were about the size and shape of a thimble. The zooids (individual animals) were larger than in the species above. We looked for them again 2 days later, but they were all gone. It's the only time I've seen these. Photo by Crissy Huffard. 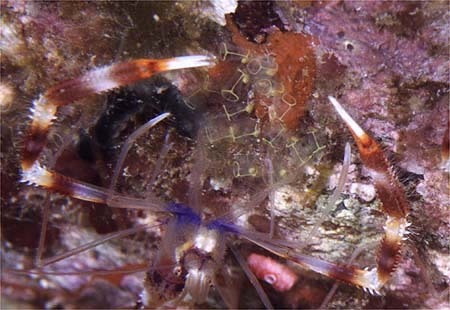 While diving at the Pupukea Firehouse in the summer of 2005 I took a photo of two Banded Coral Shrimps (Stenopus hispidus) in a cave at about 80 ft. 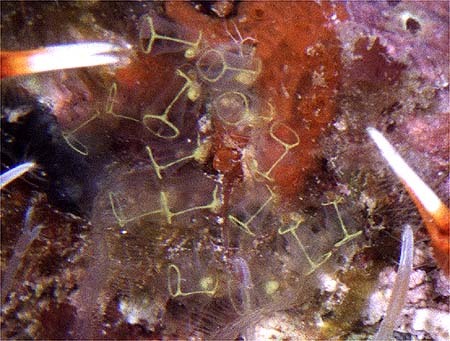 When I looked at the photos I was delighted to find that between one of the shrimp's claws were some beautiful little tunicates that appear to be a members of the particularly attractive genus Clavellina, though apparently no representatives of this genus have yet been officially recorded from Hawaii. They sure are small. I don't know that I would ever see them in the field unless I knew exactly where they were in advance. Here is a photo of something similar.